Former Chelsea defender David Stride had been in charge of Southern League Bashley for just 40 days. 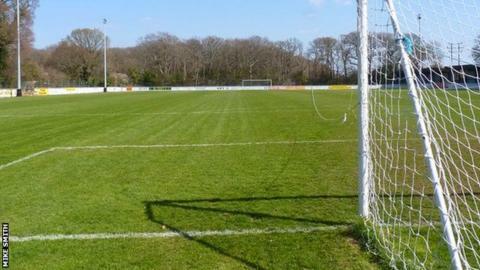 The New Forest club's newly appointed board have named former manager Steve Riley as Stride's replacement. Bashley have lost all four of their pre-season friendlies so far, failing to score a goal and conceding eight. Stride, 57, had only been in charge for two of those matches. "We made a tough decision to change things around now rather than the possibility of having more upheaval during the season," chairman Tim Allan said. Stride made 35 appearances for Chelsea between 1978 and 1980 and also played for Leyton Orient and Millwall in the 1980s. He was appointed by Bashley on 17 June, but five and a half weeks later and after a change of club chairman, he is out of work. "I've got no hard feelings, but sadly the club weren't man enough to tell me earlier," Stride added. "I was given the guarantee I'd be left alone for a season to take sole charge of football matters, but I'm gone after just two games."